My absolute favorite dogs are pitbulls and staffordshire bull terriers. One day I will have, but till then I will just draw them. 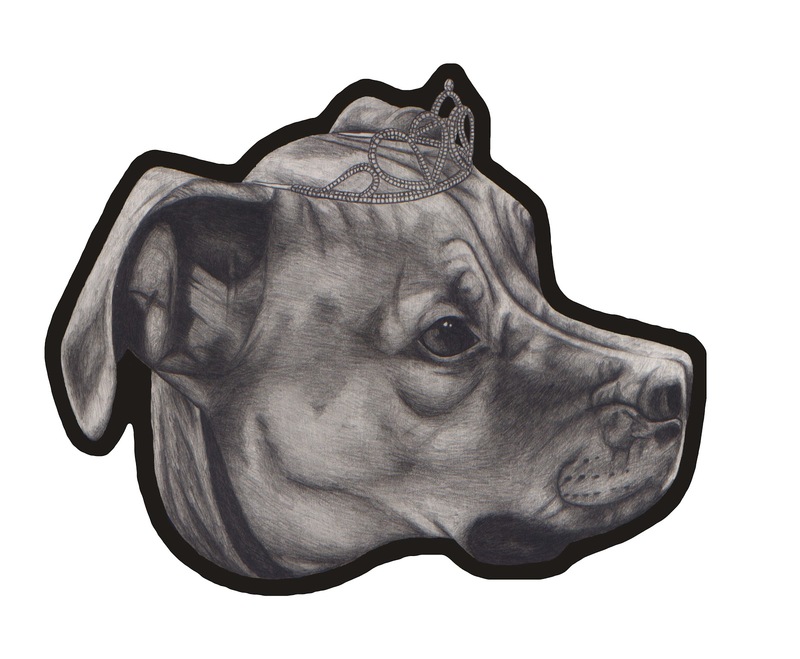 Send me your pics of your pit or staffy for a dog portrait and I will give you a wicked sweet deal, 125 bucks. This "wicked sweet deal of the week" is for 2/24 to 3/02. ktwillsey@gmail.com is my e-mail. Please head the e-mail with Bad Cat Portraits. I await your pics of your pit or staffy dogs. Frankie like pillows. I like to draw. New pet portraits are in the works. The "ring leader" is on the drawing table. If you are reading this, I'm looking to draw pitbulls and staffordshire terriers. These dogs are my absolute favorite and want to get one of my own some day. Till then, I will just draw these dogs. I will give a sweet deal for you to have a pet portrait of your pitbull or staffordshire terrier, just contact me at ktwillsey@gmail.com. Send me your pics! Here is "the octopus." This is a high quality digital pigment print (giclee). I started drawing this character a few years ago and it has evolved to this. 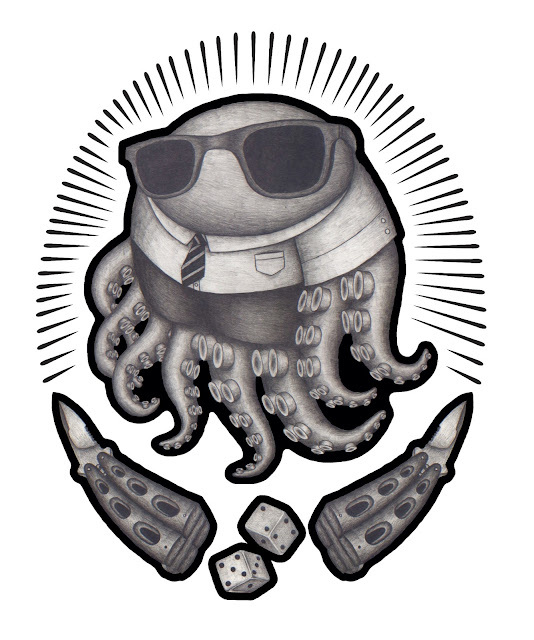 The octopus is always in some kind of slick business wear, always looking dapper. Ride bikes, the octopus is all about it. Chill out with a beer, the octopus is there. 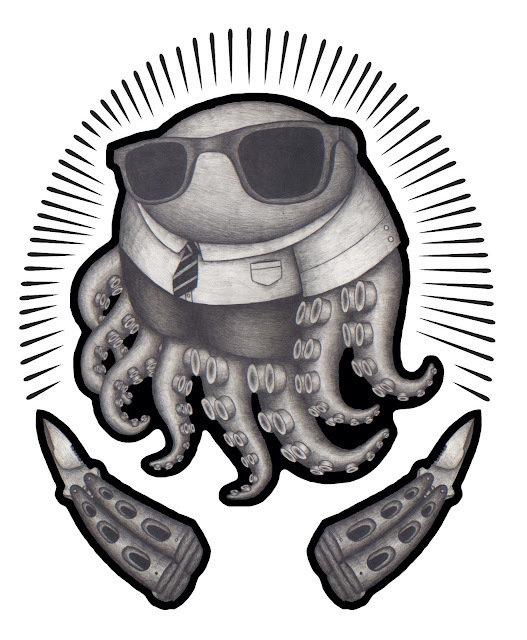 The octopus is all about looking hip and keeping it real. 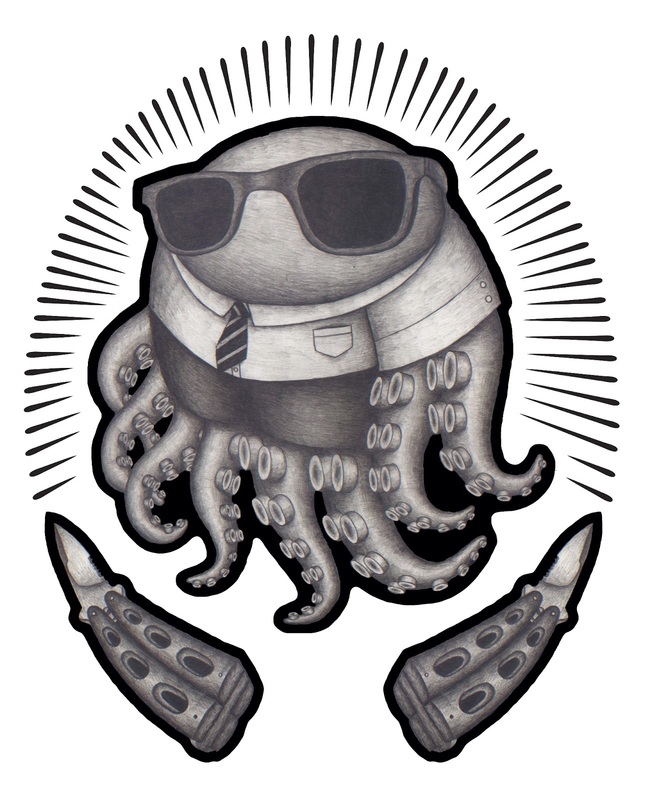 "The octopus" print is yours for $20.00. 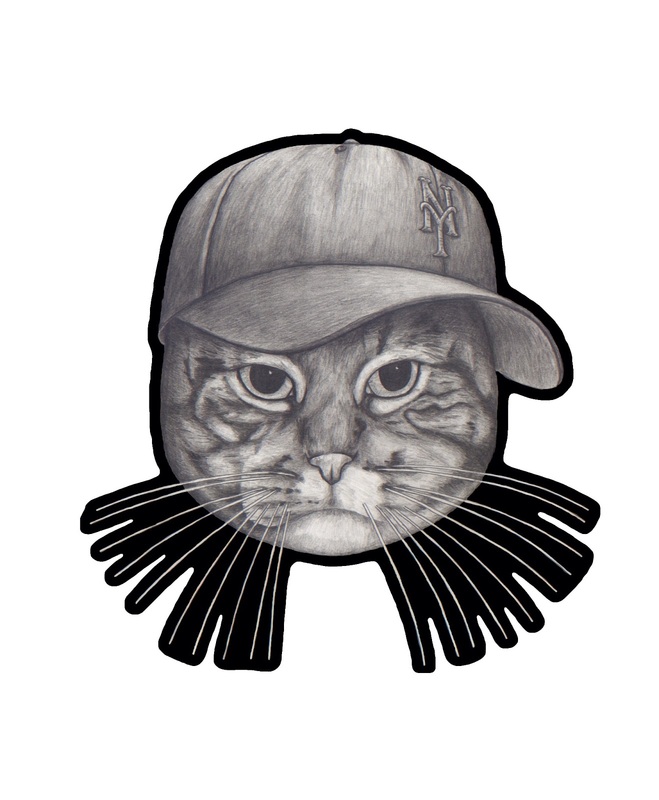 You can buy the print in my Pencilhead store. Click here! I have been working on a new art piece for a "giclee" ( high quality digital pigment print ) print. I think I need to still work on this piece, but it's getting there. I like what is going on so far. Just needs a little tweek here and there. Stay tuned for a new print to be released called "The return to cool." I did some rework to this board. I always felt like it was missing something. I think it is complete now. All skateboards I have made are for sale, $125. You can check out all the boards under my art portfolio at skateboards or just click here. Enjoy! Yo, Check it! It's Minnie representing her fine borough Queens, NY. Minnie is lookin' G! She has a mean mug on here, but I hear she can be a sweet cat too. Here is another look at the pet portrait of Minnie. As always, I draw with a black pencil and do outlining in black acrylic. Enjoy! The Desmond files...Spring is almost here! The rain has stopped and the sun is out! 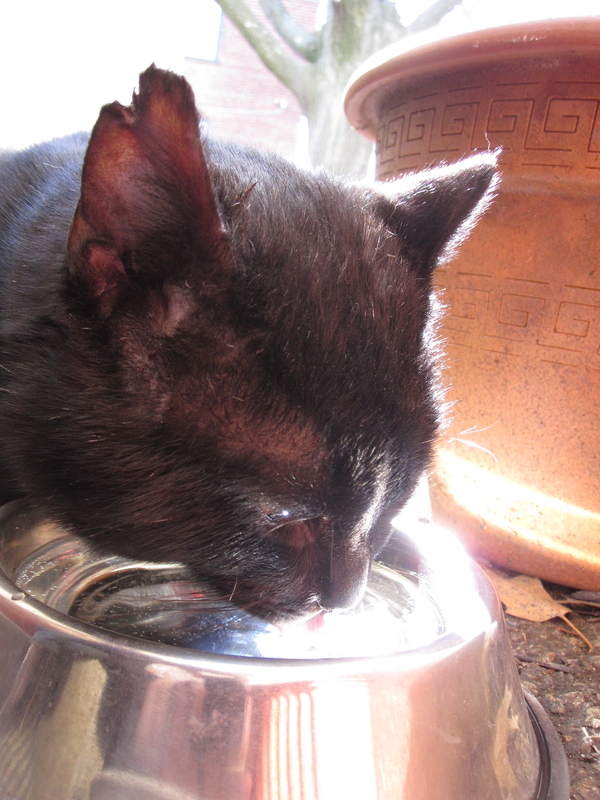 Desmond comes out of his shelter from his mid afternoon nap for a drink. His ear is on the mend and his injured leg is almost 100% better. Winter takes a beating but Desmond keeps on keeping on. ...Yep, definitely time for another cat nap. 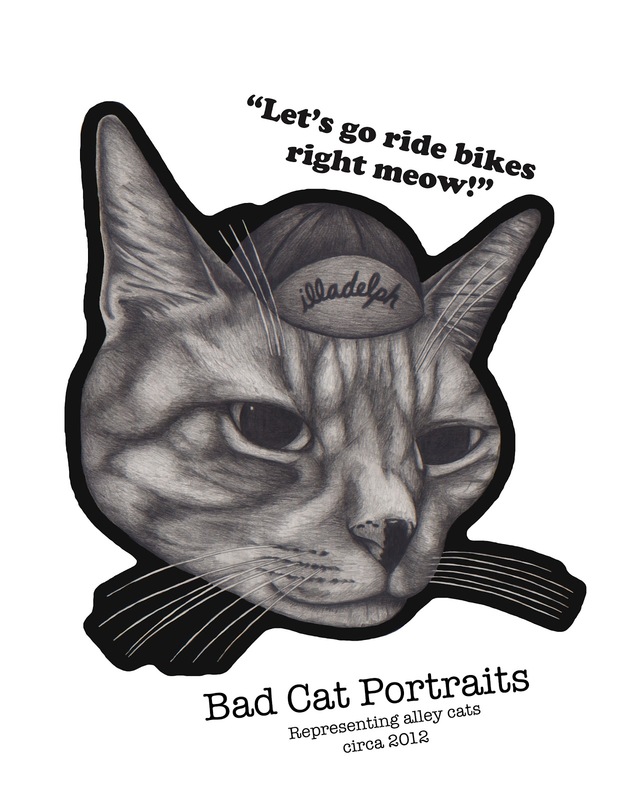 Bad Cat Portraits now has a store on Bigcartel.com. They have a great concept there. Go check out my store by clicking here. Enjoy! Stay tuned for more updates to the store. 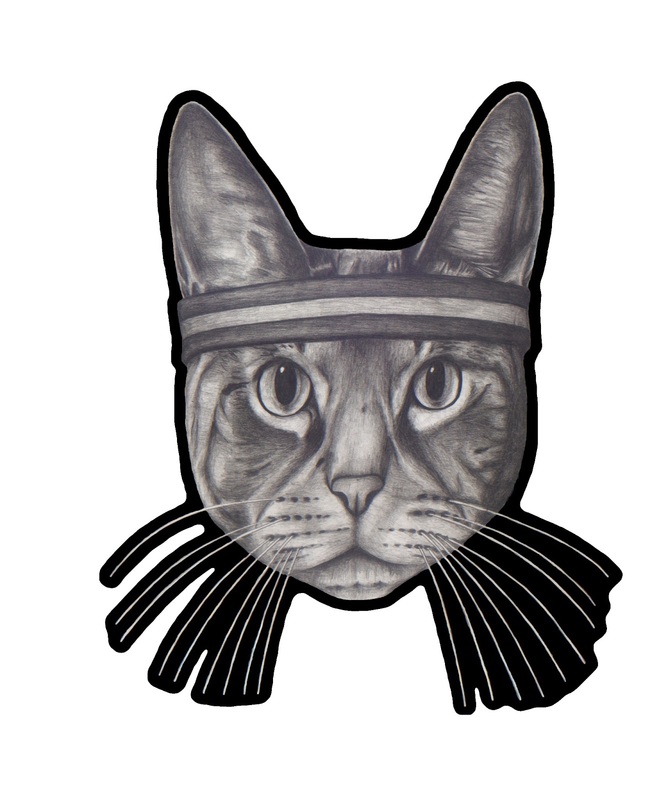 Bad Cat Portraits T's might possibly be on the way next. Here is a pet portrait of another cat from Philly. It's Ziggy. Enjoy! The Desmond files...Desmond runs this show! 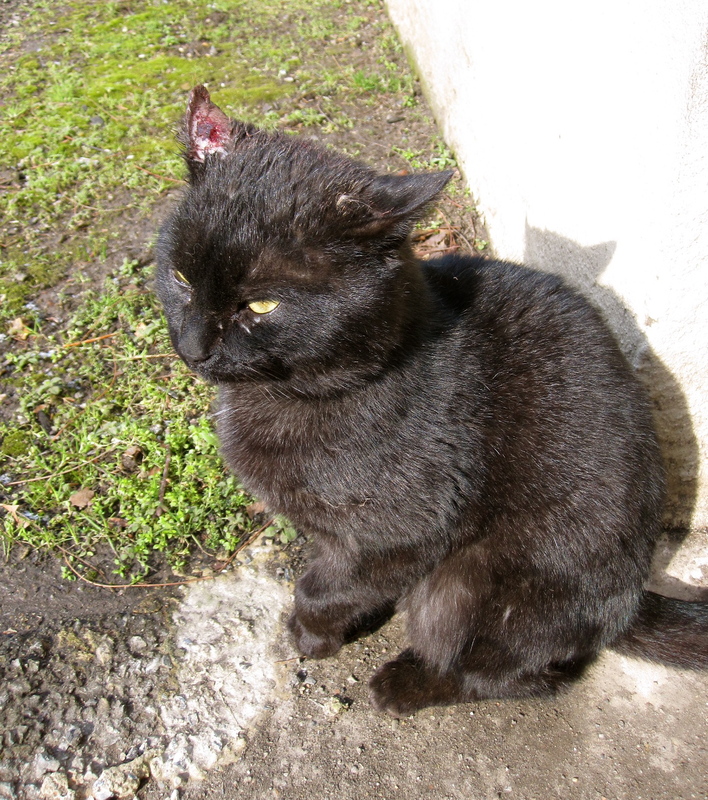 Desmond came home a few days ago with a mangled ear. Hard to say what he got into this time. His ear was healing up, but he just keeps rubbing it raw. I try to clean it out for him. Sometimes he is cool with me doing that. Last time I tried, he put up a fuss and went in his shelter. Definitely had the "don't touch me" face on that last time. I'll try again later. A few nights ago, I was woken up around 2 am hearing growling. Immediately, I thought it was Chauncey growling at Frankie. Nope, both cats were sleeping in bed. I jumped out of bed to look out the window and saw a cat. A cat I have yet seen around here. 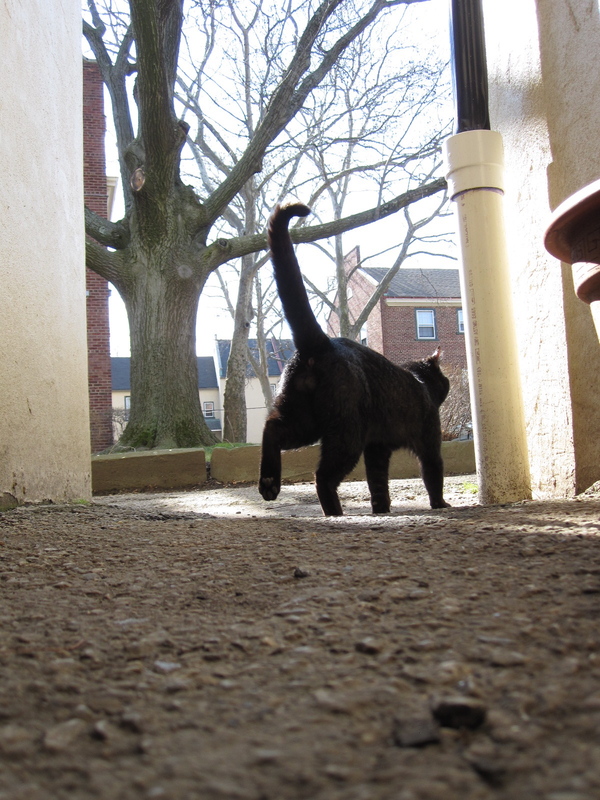 This cat was right outside my door where Desmond's shelter is. A cat challenging Desmond, what the what? Clearly this cat doesn't know of Desmond. Desmond must not have felt to threatened, he just stayed in his shelter while this other cat growled up a storm. Or, it was just too damn cold out to move from a warm spot. I opened the door, unknown cat ran off. I was done with hearing cats growling at 2 in the morning. Just another cat trying to move in Desmond's territory. This has happened before. Still, with an injured leg slowly getting better, Desmond runs the show. I swear, Desmond is like a ninja out there in the back yard. I've seen him slither through the grass and disappear in the shadows while stalking another cat. He is one smooth cat and will also let it be known that he is the champion alley cat. Hey, I've seen neighbors walk their dogs by. Their dogs do a double take at Desmond with a face of "oh snap, not that cat!" Oh yeah, Desmond loves to rub up against my leg looking for attention. He let's his guard down occasionally. Let's go ride bikes right meow! 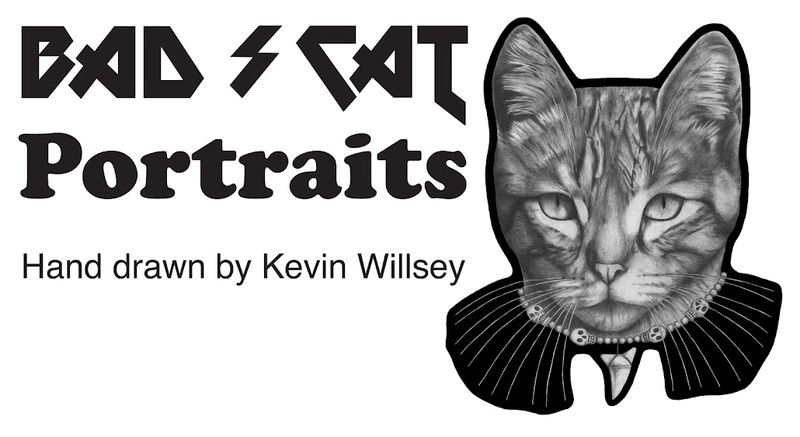 Bad Cat Portraits.